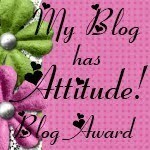 I want to Thank Tammy at tt.scraps and Janet at Paper Hoot for the Stylish Blog Award as well as Melissa at Moe Creations for the Attitude Blog Awards. I really appreciate it and I am thankful as well as humbled that you guys thought of me. Thank you again. In accepting these awards there are a few stipulations that I must follow. 1. First- Thank and Link this award back to Tammy at tt.scraps. Janet at Paper Hoot, and Melissa at Moe Creations. Thank you Janet !!!! Thank you Tammy!!!!!! Thank You Melissa!!!!! For some great inspiration please visit these ladies. You won't be disappointed. You are the sweetest!!! Thank you so much!!! Congrats on all of your awards.. and thank you for stopping by my blog.. I really appreciated your sweet comment. Congrats on your awards! You are super talented! Congrats on the award, I also have one for you on my blog!!! I hope you had a wonderful thanksgiving:0). Have a blessed day!